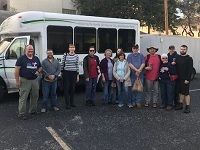 Twenty members of the Presbyterian Project spent the week of January 13 to January 20 in Corpus Christi, Texas helping victims of Hurricane Harvey. I left with four others on January 13 and drove to Texas while pulling the Presbyterian Project tool trailer behind us. The remaining 15 mission trip members flew to Corpus Christi on January 14. Hurricane Harvey was a catastrophic flood disaster dropping 40-61 inches of rainfall in southeast Texas from August 25-29, 2017. The floods inundated hundreds of thousands of homes, displaced more than 30,000 people, and prompted more than 17,000 rescues. It is tied with Katrina as the costliest tropical cyclone on record, costing almost $125 billion in damages. As we came closer to Corpus Christi, we could see the remaining evidence of this disaster in the piles of debris placed in the median of the highway, buildings missing roofs, and trees still down. Even though some work had been done, there was still a lot to do. We worked on several projects during the week. Four tiny houses in a trailer court needed electricity run through them and steps made to have access to the houses. We cleaned up around some trailers that had been destroyed. In one house, new windows were put in and, in another, walls were removed due to the roof coming off and water getting into the house. Tarps were put over the damaged roofs of two houses to keep any additional water from going in. This was a difficult job as the winds were really strong and we were not sure that the tarps would stay in place. The weather was cold, almost like being at home, except we had a beautiful view of the bay and the gulf. Because of the weather, it was hard to get a lot done, but we made progress and the people were glad for the help. I have gone on a few trips with the Presbyterian Project and all of them have been a great experience. The people that make up the groups may change but it is always a great group of people. It is a joy to be able to help people who are facing hard times and to share the love of our Lord.